Writer resolutions you might just keep! This time of year you can find a million pieces of advice online about making this the year you write that novel, finish that screenplay, Become A Writer or whatever, and lots of that advice is really useful. But not all of it will work for you – and nothing will crash your good intentions faster than trying to implement a rigorous schedule of multiple new habits all at once. Pick a few small changes to start with – you’re more likely to stick with them and see results. You can always add more later. One of the reasons I like books about writing is they often throw up ideas or exercises that I wouldn’t ever think of – and, more than that, that I would normally run a mile from doing. But while you ultimately need to find techniques and habits that suit you, it’s worth at least trying things that might not initially appeal, whether it’s reading your work aloud, or going on an ‘artist’s date’ – the very act of stepping outside your comfort zone can be useful in itself. ‘Real writers write every day’ is probably the most common, but these come in many hues. ‘Real writers can’t stop writing’, ‘real writers will always find time to write’, blah, blah, blah. When in fact plenty of ‘real’ writers (if you are judging ‘realness’ in terms of success, which is pernicious in itself) only write for part of the year, or take long breaks between books, or find that life occasionally derails them just as much as it does other people. All of that said, looking at my writer and would-be writer friends, I think the biggest stumbling block is the fallacy that you will be a writer one day, just not now. You’ll do that first draft when you’re on holiday, or when you take a sabbatical, or even just when work gets a bit easier. I wasted three years between books waiting for the ‘right time’: in the end, my next novel was written in 15 minute bursts, time snatched out of busy days in a demanding job. Don’t feel like writing needs a lot of time and ceremony – you really don’t need to put aside hours and hours to do it. Sure, you might benefit from doing a writer’s class or going on a writing retreat, but don’t keep waiting for the perfect set of circumstances to arrive, or you might be a year down the line and still not have written a word. 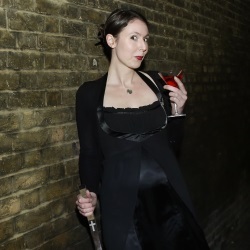 PS: I started the New Year with some exciting writer news – the lovely Zoe Cunningham (below, in full Cassandra Bick mode) is doing a one-woman show based on the Dark Dates books. I’ll be posting a Q&A with Zoe later this week, but needless to say – it’s a great start to the year! This entry was posted in Uncategorized and tagged Writing, writing tips. Bookmark the permalink. « ‘Tis the season… to be bloody miserable?